Our chewelry products are designed to provide your child a great, educational alternative to their chewing needs. We carefully engineered our product designs for children to improve tactile and oral motor skills without compromising the desire to carry it around with them. Our products come in a variety of stylish colors for both boys and girls to choose from. It is recommended to chew on this pendant using the back molars to effectively trigger the jaw muscles and enable responsive proprioceptive sensory feedback. Our chewable necklaces can be fun and great for sensory and behavioral education and children with special needs. Children and teens with disabilities, ADD, ADHD (attention-deficit/hyperactivity disorder), Autism, SPD (sensory processing disorder) and anxiety disorder can find this necklace to be a great tool to improve their oral sensory processing, tactile coordination, fine and gross motor skill conditioning, behavioral skills, and appropriate speech therapy and communication skills. Our pendants can help children overcome their sensory processing challenges by providing exercises that promote responsive informational exchanges within the nervous system and musculoskeletal system. Our products are carefully inspected and responsibly made in China. CAUTION: This product is NOT a toy. Only chew on pendant and not cord/ clasp. This product contains small parts that can cause choking. Discard when product shows sign of wear and tear or is defective. Adult Supervision required at all times. This product is not recommended for children under 5 years of age. NEW & IMPROVED DESIGN - Our chewable necklaces were designed to help oral motor stimulation and speech/ behavior development for sensory-seekers and those with special needs. It can also aid in reducing anxiety, improving calmness and focus, teething, fidgeting, and can keep them from chewing on their fingers, nails, collars, sleeves and more. PLEASE ADVISE the user to NOT chew off the blocks and to avoid aggresively chewing on the tips & edges of the pendant where breakage is more likely. STYLISH & TOUGH - Our chewable pendants were designed to look stylish and unisex without being overly flashy so it can be worn confidently amongst others. Each chewelry necklace comes with a pendant, an adjustable 26" cord, a break-away clasp, and an extra set of clasps. Pendants are reusable and washable with mild soap and water. 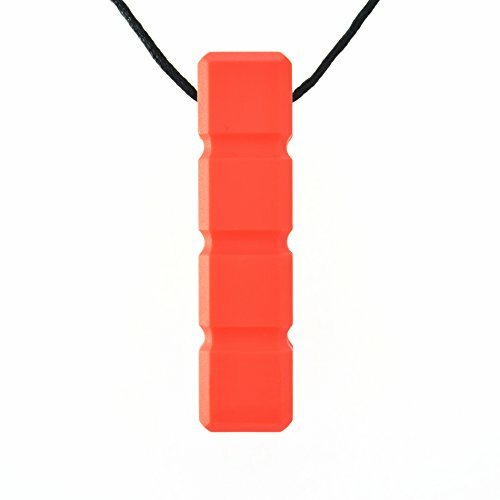 FOR MILD, NON-AGGRESSIVE CHEWERS - This pendant was assembled with tough durability for mild chewers and should not be used for intense and aggressive chewing. Though no pendant is indestructible, our pendants are tough and durable enough to endure mild to moderate usage. The dimensions of the pendant are 64mm x 16mm x 16mm, and can reach the back molars to trigger sensory input on the jaw muscles. SAFETY FIRST - Our FDA-approved pendants are made from 100% non-toxic, food-grade silicone that is free of lead, BPA, and phthalate. Each necklace comes with a break-away clasp to prevent potential neck and head injury and choking. The cord and clasps are not intended for chewing. PLEASE ADVISE user to NOT chew the blocks off. This product contains small parts that may cause choking. Adult Supervision Required. OUR COMMITMENT - Quell-O is committed to providing only the best quality products and proudly adhere to our 100% Customer Satisfaction Guarantee and 100% Money-Back Guarantee! All of our pendant designs and products are owned by and exclusive to Quell-O. All other products bearing similarities are imitations and not authentic. Please do not hesitate to contact us with any questions, quality issues, or comments! If you have any questions about this product by Quell-O, contact us by completing and submitting the form below. If you are looking for a specif part number, please include it with your message.